I bought signed copy of The Wicked + The Divine • Vol 3. – Commercial Suicide + had a wicked talk with the Valkyries at my LCBS. My LCBS had signed copies of WICDIV and Phonogram by the creators, and of course I needed to get it! 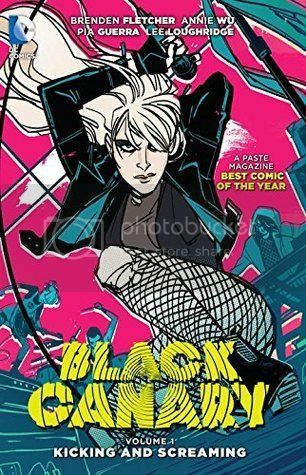 I grabbed myself volume three, and WORTH EVERY PENNY. I’M SO HAPPY THAT I GOT IT BECAUSE IT IS MY FAVORITTEEEEEEE. Every time I look at it, I shake in excitement. IT IS MY PRECIOUS. I received this book for free from Del Rey for review consideration. This does not affect my opinion of the book or the content of my review. Imagine the earth opening up below you, and you fall through and land in the palm of a giant metal hand that’s glowing turquoise with weird symbols carved on it. That’s exactly what happens to Rose Franklin when she was little. Nobody knows what this giant metal hand is or where it came from, but it’s there in the ground, and it sets off the greatest sci-fi mystery that Sleeping Giants strives to uncover. Wonder Woman isn’t like most high school students. Super Hero High isn’t like most high schools. Wonder Woman is an Amazon warrior and princess. She has never left her home on Paradise Island. But she wants to be a super hero—the best super hero she can be. At Super Hero High, shae has to juggle intense training, new friendships, and a roommate who shares every embarrassing moment on social media. Not to mention…Wonder Woman has never seen a boy before. This is going to be harder than she thought. 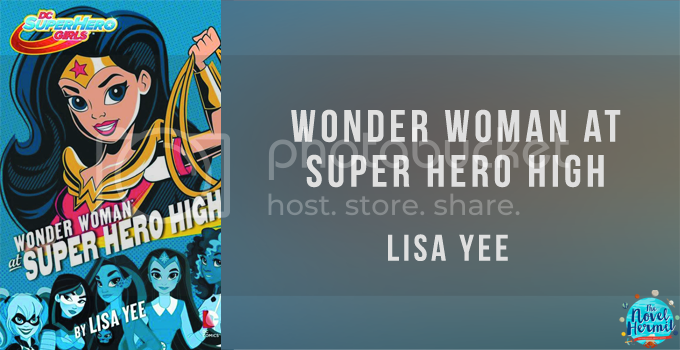 The wonderful folks at Random House asked me if I wanted to take part in a blog tour for Wonder Woman at Super Hero High, and you bet my answer was a YES. How can you say no to Wonder Woman? You absolutely cannot. Now, let me tell you all about the awesomeness of this cute book! I received this book for free from Random House for blog tour + review consideration. This does not affect my opinion of the book or the content of my review. Every kid wants to go to a magical school like Hogwarts or Super Hero High. Wonder Woman wants to too. In this Middle Grade book, Wonder Woman has big plans to be one of the best superheroes ever, and to be the best, she wants to go to a school that’ll help her become that and even more. If that means she has to leave Paradise Island, the only place she’s ever known, she’ll do it. With her mother’s blessings, she sets off on an adventure that’ll help her become a great superhero, make wonderful lifetime-lasting friendships, learn to deal with “mean” girls (who Wonder Woman probably doesn’t see as being mean on the account of her trusting nature), find out who’s been leaving threatening notes to her, and much more. A tea party takes a poisonous turn leaving Daisy and Hazel with a new mystery to solve in the second novel of the Wells & Wong Mystery series. Schoolgirl detectives Daisy Wells and Hazel Wong are at Daisy’s home, Fallingford, for the holidays. Daisy’s glamorous mother is throwing a tea party for Daisy’s birthday, and the whole family is invited, from eccentric Aunt Saskia to dashing Uncle Felix. But it soon becomes clear that this party isn’t about Daisy after all—and she is furious. But Daisy’s anger falls to the wayside when one of their guests falls seriously and mysteriously ill—and everything points to poison. It’s up to Daisy and Hazel to find out what’s really going on. With wild storms preventing everyone from leaving, or the police from arriving, Fallingford suddenly feels like a very dangerous place to be. Not a single person present is what they seem—and everyone has a secret or two. And when someone very close to Daisy begins to act suspiciously, the Detective Society does everything they can to reveal the truth…no matter the consequences. Guess who’s back! The Wells & Wong Detective Society are back at it again with a murder case that’s a little close to home. At Fallingford (Daisy Wells’ home) for the holidays, Daisy and Hazel Wong find themselves surrounded by people (most who reside at the house or are guests) acting all sorts of suspicious with the arrival of Denis Curtis, a “friend” of Lady Hastings. What is wrong with all these adults? When one of guest falls ill from a poisoning, Daisy and Hazel realize the culprit is still in Fallingford, and it is up to them to get to the bottom of it.